What Should I Do If I Cannot Tolerate a CPAP? Why can't I tolerate my CPAP appliance? While a CPAP appliance is the most effective sleep apnea treatment, many patients find it uncomfortable and even painful to use. Another common problem with CPAP machines is that many patients take them off in the middle of the night without realizing it. If your CPAP appliance is causing discomfort the most common reason this may happen is because the head gear is not fitted properly. If you have already addressed this issue you may be a candidate for alternative Sleep Apnea treatment options or Snoring treatment options. What are the treatment options if a CPAP doesn't work for me? The initial treatment option for OSA is commonly a Continuous Positive Airway Pressure (CPAP) appliance. If you have tried a CPAP appliance and have not had success with it there are other options available. These options include oral appliances, surgery, behavior therapy, or by a combination of these approaches. What is oral appliance therapy (OAT)? OAT involves the selection, design, fitting and follow-up care of a specially designed oral appliance that, when worn during sleep, maintains an opened and unobstructed airway in the throat. 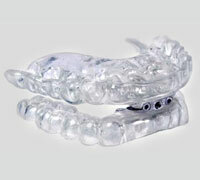 Oral appliances that treat snoring and obstructive sleep apnea look similar to sports mouth-guards. Visit the AADSM Web site to read more and to locate a dentist trained in dental sleep medicine in your area. Habitual snoring affects an estimated 24 percent of adult women and 40 percent of adult men. Approximately one-half of people who snore loudly have obstructive sleep apnea (OSA). An estimated 18 million Americans suffer from obstructive sleep apnea. Eighty to 90 percent of these people remain undiagnosed and untreated. Twenty-five to 50 percent of sleep apnea patients cannot tolerate or comply with CPAP.